« Why Does My Child Have Bad Breath? There are so many symptoms of the winter cold and flu season that leave us miserable: runny noses, persistent coughs, and the occasional stomach bug. Thankfully, there are many different medicines that we can take to keep our symptoms at bay long enough to power through the day. Unfortunately, many cough medicines can damage our teeth and oral health! There are plenty of ways to find cold relief and protect your pearly whites this winter. Read on to learn more! Cough drops and lozenges are designed to melt slowly so that the medicinal ingredients have time to settle in your throat. Many of the ingredients are just for flavor, however, and they also settle on your teeth, gums, and tongue. The next time you purchase a pack of cough drops, read the label! There are plenty of natural, sugar-free options out there. 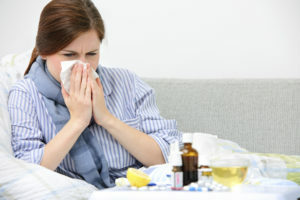 Liquid cough and cold medicine also tends to be sweet and syrupy, and often contains alcohol which dries out the mouth. Combined, this leads to a sugary film that coats your teeth and doesn’t wash away quickly. Pills remove this threat to your teeth, but if that’s not an option take you liquid medicine before a meal so that the food and drink help promote saliva production and then brush your teeth afterward. Decongestants dry your nasal passages, relieving the uncomfortable feeling of a runny nose. Often, decongestants can lead to dry mouth. Dry mouth can lead to tooth decay and gum disease because the lack of saliva allows for bacteria to flourish. Thankfully, decongestant use is usually limited to the (hopefully short) run of the cold, so while you’re using them remember to drink plenty of water and that should help. If you’ve also got a sore throat, sucking on a lozenge can stimulate saliva production to counteract the dry mouth effect. This entry was posted on Friday, February 8th, 2019	at 6:21 pm	and is filed under Teeth Cleaning	. You can follow any responses to this entry through the RSS 2.0	feed. Both comments and pings are currently closed.